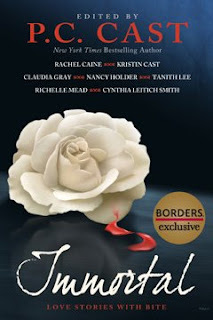 Win a copy of Immortal: Love Stories with Bite edited by P. C. Cast (BenBella, Aug. 2008)(PDF excerpt)(exclusive to Borders) from Teen Libris! Peek: "Enter to win one of three copies of the vampire short story anthology Immortal: Love Stories That Bite, signed by editor P.C. Cast. "You'll also get five 'vampire bite' tattoos from Boutique du Vampyre in New Orleans, to get into the vampire spirit!" Deadline: July 31. See guidelines and more! Note: This vampire-themed YA anthology will include short stories by P. C. Cast, L. J. Smith, Cynthia Leitich Smith, Kristin Cast, Rachel Caine (author interview), Tanith Lee, Nancy Holder, Richelle Mead, and Claudia Gray. P. C. Cast is the New York Times bestselling author of the House of Night series (Marked, Betrayed, Chosen, Untamed) with her daughter Kristin Cast. She lives in Oklahoma.